Wound Care - The Campus of the Jewish Home of Greater Harrisburg, Inc.
Bedsores, the common term for decubiti, or what now are more commonly called pressure ulcers, have met their match at the Jewish Home. 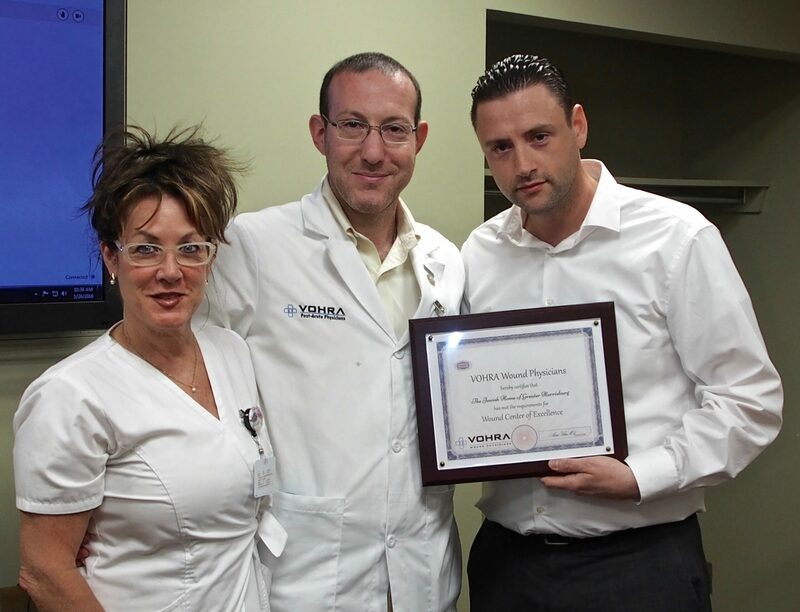 Last year, The Jewish Home of Greater Harrisburg was honored as a Wound Care Center of Excellence by VOHRA Wound Physicians, a national group of physicians who specialize in modern wound management to residents in long term care facilities. The Jewish Home was the first and facility so honored of the more than 2500 facilities in 27 states served by VOHRA. Wound management has emerged as a new specialty along with rising expectations for quality and outcomes expectations. In fact, wound management and outcomes have become a leading indicator of the quality of care in a skilled nursing facility. Because of the Jewish Home Wound Care Team’s careful and rigorous assessment protocols, pressure ulcers rarely develop on residents living at The Home. According to the most recently published statistics, residents at The Home develop half the number of pressure ulcers compared to residents in nursing homes across the country. The Home does see incipient or developed pressure ulcers in residents coming from other facilities. Dr. Aaron Blom, a general surgeon Board-certified as a Wound Care specialist physician, is the Jewish Home’s Wound Care physician. Dr. Blom makes rounds weekly at The Home, performing medical and minor surgical management of pressure ulcers – which were called ‘bedsores’ in the not-so-distant-past. Carolyn Geedy, RN, is the Jewish Home’s full-time, certified Wound Care nurse. In addition to making daily rounds to assess suspected or potential pressure ulcers, Ms. Geedy trains nursing staff in the detection of potential pressure ulcers. Pressure ulcers can develop quickly and often present a challenge to heal. VOHRA reports that their comprehensive approach to wound care management fosters a high level of awareness of the best practices in wound management throughout facilities’ staffs. And according to VOHRA, the Jewish Home of Greater Harrisburg’s award demonstrates exceptional high quality in preventing, treating and healing wounds. Carolyn Geedy, RN, Certified Wound Nurse at the Jewish Home, and Dr. Aaron Blom, Certified Wound Care Specialist Physician, accept the Jewish Home of Greater Harrisburg’s Wound Center of Excellence Award from Dr. Tzvi Volosov.